June 2, 2018 By This post may contain affiliate links. Here’s a fun way to serve a decadently rich chocolate dessert for a garden party, Earth Day, Mother’s Day, or a spring event. 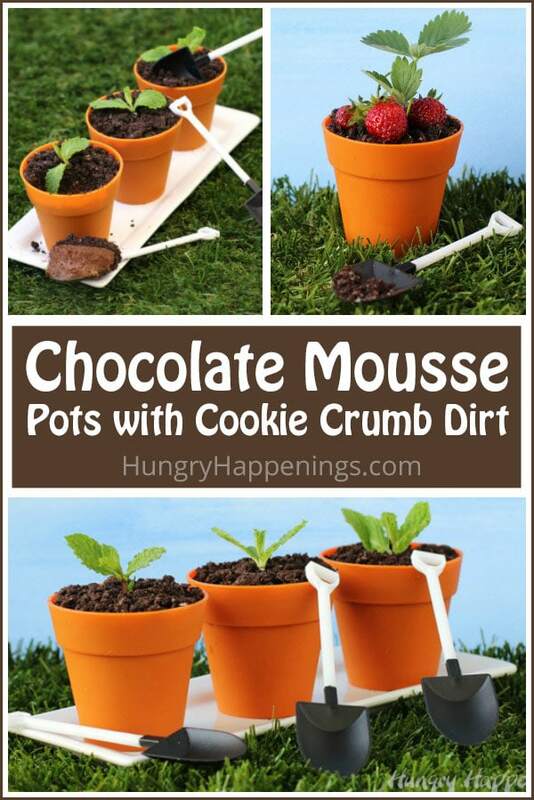 These Chocolate Mousse Pots with Cookie Crumb Dirt can be topped with sprigs of mint or tiny strawberries to look like terra cotta pots filled with little plants. Sometimes it takes me a while to get around to making my ideas become a reality. Last spring I bought some silicone terra cotta pot baking cups and created my Carrot Thief Cupcakes. 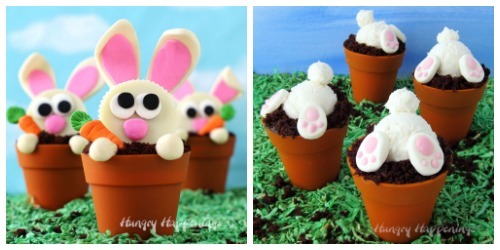 Those fun little treats had Reese’s Cup Bunnies popping out of the tops of flower pot cupcakes and were so stinkin’ cute. Soon afterwards, I found some little plastic shovels that can be used as spoons and I just knew I had to make these Chocolate Mousse Pots. I was so excited to pair my little shovels with a these flower pot desserts that I didn’t do a search to see that this idea was not unique. I strive to share original ideas with you, but this time, even though several other people including, Gemma from Gemma’s Bigger Bolder Baking, had beat me to the party, I decided to share this springtime recipe with you anyway. I filled my flower pots with my favorite chocolate mousse, which is seriously the best you’ll ever taste. So I hope you’ll forgive me for sharing an unoriginal, but really fun, idea with you today. 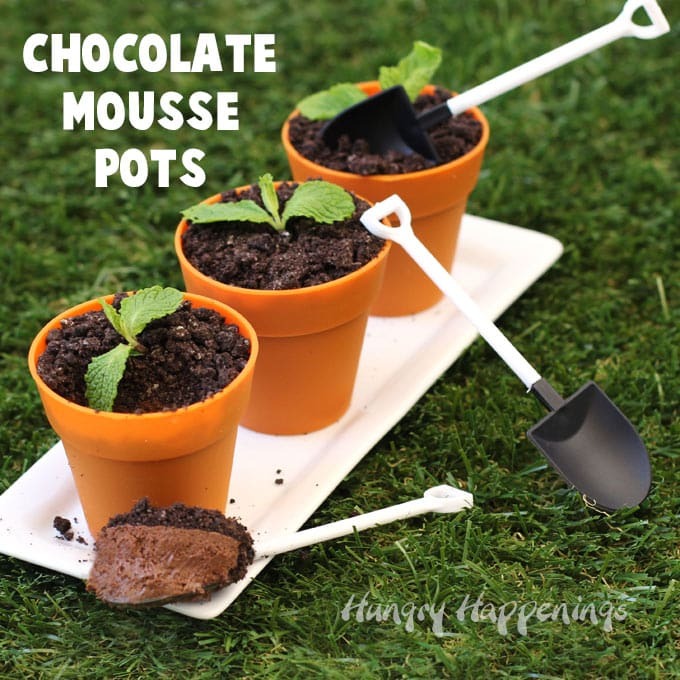 To make these Chocolate Mousse Pots you’ll need some silicone flower pots and some little shovel spoons. You’ll also need some of your absolute favorite chocolate to make the mousse. Don’t skimp and use cheap chocolate chips. Get some bars of chocolate that you really love to eat. You can find these supplies on amazon (commission earned for sales). I’ve shared a few links to the silicone flower pots so you have options. The mousse recipe below filled 12 of the Wilton Terra Cotta Pots. I’ve also linked to the Peter’s Burgundy Dark Chocolate that I use to make my chocolate mousse. It’s available in 10 pound bars. I know that’s a lot, but it will keep for over a year and it makes the most amazing chocolate mousse and chocolate truffles. You can also chop it into small chunks and use it in chocolate chip cookies. 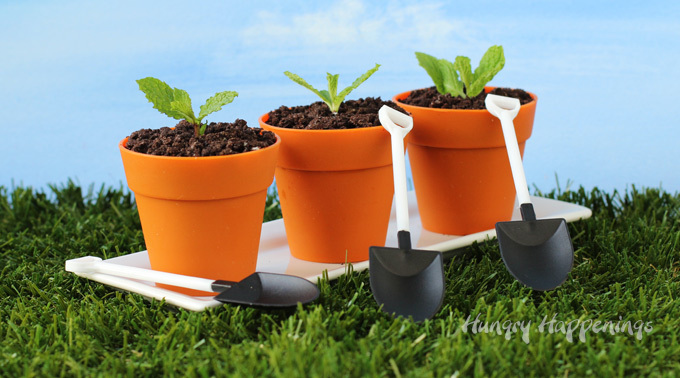 Rich and creamy chocolate mousse served in silicone terra cotta pots topped with cookie crumb dirt and sprouting mint leaves will add a festive touch to a garden party or spring event. Pour 1 1/3 cups heavy whipping cream into a mixing bowl and whisk, or beat using an electric mixer, until you get stiff peaked whipped cream. Set aside. Combine water and sugar in a saucepan and heat over medium high heat until it comes to a boil, stirring until the sugar completely dissolves. Remove from heat. Whisk the egg yolks in a mixing bowl. Continue whisking while slowly drizzling in the hot sugar water. Return this mixture, along with the remaining 2/3 cup heavy whipping cream, to your saucepan and continue to stir constantly while heating over medium low heat until the mixture reaches 160 degrees F and starts to thicken slightly. Pour through a fine mesh strainer set over a bowl of melted chocolate. Fold in half of the whipped cream until well blended then fold in the remaining whipped cream. Pour into 12 silicone flower pot baking cups. Sprinkle cookie crumbs over top of each pot. Remove from refrigerator and let rest at room temperature for at least 15 minutes. Insert mint sprigs into the center of each chocolate mousse pot or top with tiny strawberries and strawberry leaves. Use your favorite chocolate to make this chocolate mousse. You'll need this full recipe to fill 12 silicone flower pots. The video shows a smaller recipe using only 3 egg yolks which was only enough to fill 9 pots. I hope you have fun making these Chocolate Mousse Pots for your own garden party or spring event. I’d love to hear what you decide to plant in your flower pots in the comments below. There are 2 places where video supposedly shows up – which is weird. Now I see your hand with little shovel in one of the 2 video windows, but doesn’t move past that. 2nd video window is black with continually circling circle. Not to fret = I’ll try again later today. Thanks for letting me know Tavette. It should be fixed now. The first video is the actual recipe video and the second video is a rolling video player that plays all my videos. Sorry for the confusion. Enjoy! Sooooo cute and sounds delicious, when I made my little herb garden cupcakes, I didn’t have any spoons!! Now, I MUST get the shovels, I mean spoons! The shovels really do make these desserts extra special.